ow. While some couples want something traditional and yet unconventional, others want something unusual, exceptional and avant-garde. In my opinion, every great wedding is centered around a theme. Be it something close to your heart or based on a color or a story or a concept. We have done many wedding that centre around spiritual beliefs and religion like Shiv Parvathi theme for wedding or Radha Krishna theme for Sangeet. Everything from the set-up, props, decor and food can be involved to weave this theme. In one wedding we made a huge fiber statue of Radha Krishna and placed it at the entrance of the venue. We used floral peacocks as props to create an aura of Vrindavan and had a ‘phoolon ki holi’ as one of the acts. We also used bansuri as one of the main elements of the wedding along with the peacock motif and incorporated it in many ways including in the wedding invites. For a shiv parvathi theme, you can incorporate portraits of them or their sculpture as one of the main elements. The mandap can have elements like rudraksh and ‘OM’ motif as a backdrop. Genelia D’souza and Ritiesh Deshmukh’s wedding had Ganpati figurines on all 4 sides of the mandap that personified the relation between Shivji and Ganpati. A stark opposite of the traditional theme, a contemporary theme is more modern and westernized in its appeal. The use of lights, LED screens, cocktail bars, crystals, lounges and English style tall centrepieces are used to highlight this theme. 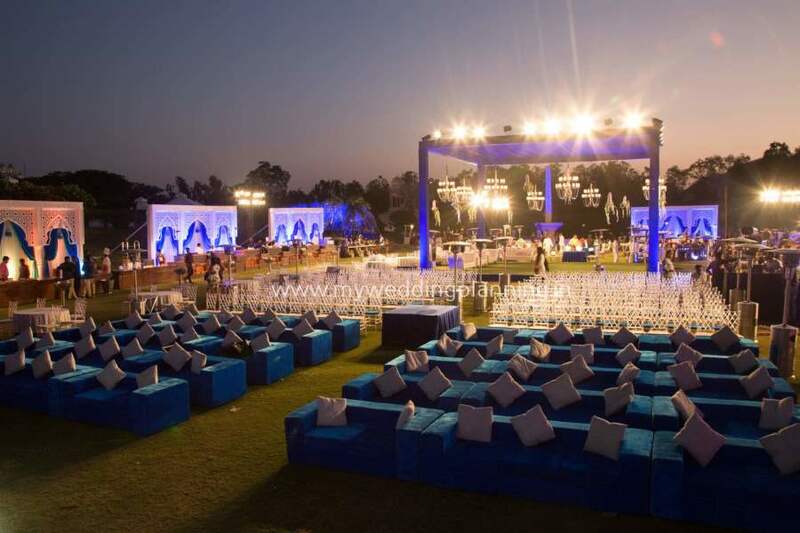 When we create a contemporary theme for a wedding, we try to avoid a formal stage and instead let the couple interact with the guests in an informal setting. When we create a contemporary theme for a sangeet, we use dark evening colors like purple and lilac. This one is my personal favourite. A Rajwada theme is a royal rajasthani theme that transcends you to the bygone Rajputana era. Rajasthan is colourful, vibrant and powerful and so is this regal theme. From colourful rangolis, colourful pots and props to lavish fabrics with a traditional flavour like bandhani to carts and jhulas, this theme is loud and festive. Ghoomer dancers, chari dancers, folk singers and local artists can be used as entertainment. The bride comes in a decorated palki or carriage and the groom comes on a ghodi. Lots of fireworks and traditional dal baati churma can add that extra punch to make it even more memorable. Love Hawaii? Have a Hawaiin pool party as your welcome party. Take care of every last detail from drinks, garlands, neon props and a funky photobooth. Forts and Palaces with European flavour can also be created if you want a Venice Theme. One of the trendiest themes right now is a Moroccan theme that is based on Middle Eastern influences like hookas and mosaic lanterns. This is one creative theme that engages your family and friends making them an important part of your wedding celebrations. Based on Chinese influences and oriental motifs, this theme is in rage at the moment. Bespoke and unusual you can use Chinese umbrellas, dragons and kimono clad girls to complete this look. Using floral props like peacocks and elephants as well as floral mandaps, floral theme is extravagant and expensive. 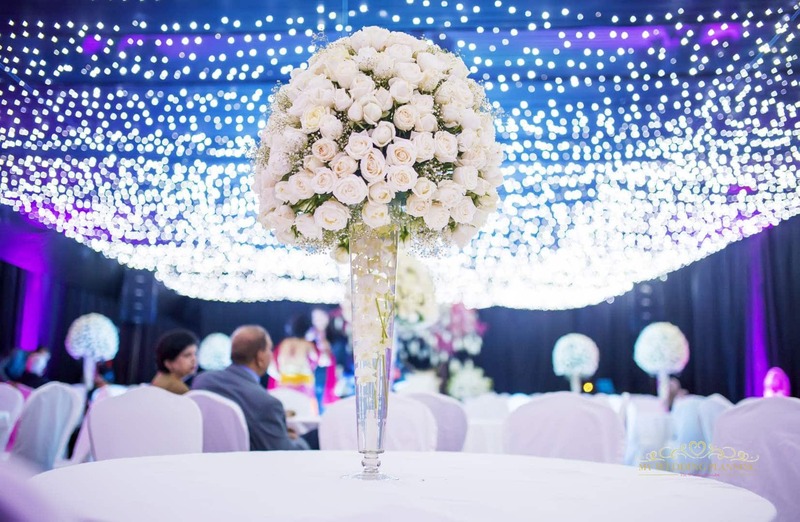 Couples now opt for exotic and expensive imported flowers like Hydrangea (loveeee it), Thai roses, Peonie, Orchids, and Alstoma. If you wish to have a floral theme on a budget, how about considering a lot of marigolds in golden orange and yellow? My personal fav is red rose pastings and sunflower. A fresh and beautiful theme, Garden theme is perfect for outdoor pre wedding celebrations. Birdcages, crystals, chandeliers and candles add mystique to the vintage theme. Add rustic elements like wooden boxes and wooden furniture and you’re good to go. Gatsby is all about glitz, glamour, and opulence — making it the perfect inspiration for a luxurious wedding theme. You can create a gandola made of fiber or thermacol as your star attraction. Use of venetian masks, arches, chandeliers and feathers add to the charm of this theme. Need help planning and executing these delightful themes? Get in touch with us at weddings@myweddingplanning.in and we would love to help!